Learn how to prepare your business for growth and maximise its productivity, profitability and efficiencies. 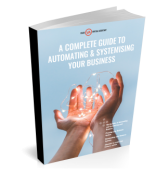 "How to Automate and Systemise your Business"
This guide includes everything you need to build a smarter, more profitable business. Before you build anything you need a plan!